The music is lurching and extraterrestrial; its clanks and clunks recall the industrial backdrop of the film itself. The vocals are cartoonish and pinched. The guitars are barely recognizable as guitars. 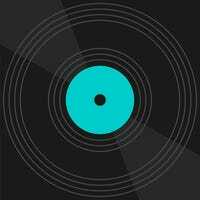 Synthesizer provides the lead melodies. The beat is kept on a set of primitive electronic drums built by Jim Mothersbaugh. The Truth About De-Evolution is a grimy, dystopian horror show, populated by mad-scientist preachers, a father figure with a military ranking, and clownish man-child whose name is spelled “Booji Boy” but is pronounced “Boogie Boy.” But the end turned out to be a new beginning. The Truth About De-Evolution took first prize at the Ann Arbor Film Festival in March of 1977; later that year, the group would relocate to California, be hailed as “the band of the future” by David Bowie before a gig at Max’s Kansas City, and head into the studio to make its first LP with Brian Eno. Forty years later, the results of those sessions remain some of the strangest tunes ever released on a major label. The first side of Q: Are We Not Men? A: We Are Devo! ends with the fight song from The Truth About De-Evolution’s deranged lecture-hall pep rally, “Jocko Homo,” its guitars beefed up and its drums now played by a human metronome named Alan Myers. Side two picks up with “Too Much Paranoias,” a lumbering mechanical monster whose lyric sheet is part body horror, part commercial break. The first voice heard on the track is the type of bull rider yawp you’d hear when a Looney Tunes character plunges off a cliff, or when Slim Pickens straddles the nuclear payload at the end of Dr. Strangelove. 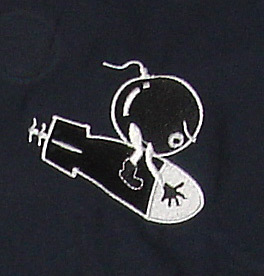 That image of weaponized jingoism and eroticism fits Devo like a glove: A cartoon of a bomb riding another bomb, lifted from a pamphlet of U.S. Air Force squadron emblems, recurs throughout the band’s visual iconography. Q: Are We Not Men? A: We Are Devo! is also the sharpest expression of the core concept that would also prove to be Devo’s greatest liability. Mired in the ’70s, warped by the failures of the hippie movement (Jerry Casale was there when the Ohio National Guard opened fire at Kent State University), and raised amid Eisenhower kitsch, the members of Devo made art that looked toward the future, but didn’t look forward to it. Like plenty of dabblers in speculative fiction, they took the ills they witnessed in the present—corporate greed, man’s cruelty to man, spiritual exploitation—and projected it onto the world of tomorrow. And onto themselves: Rock ’n’ roll rebellion had coalesced into its own lucrative, mass-produced conformity, so Devo rolled with it, dressing in matching outfits and presenting themselves as representatives of a wide-reaching conglomerate, Devo Inc., which distributed not only music, but also consumer merchandise and missives from fellow Devo Inc. cogs like Booji Boy, General Boy, and Nu Tra. 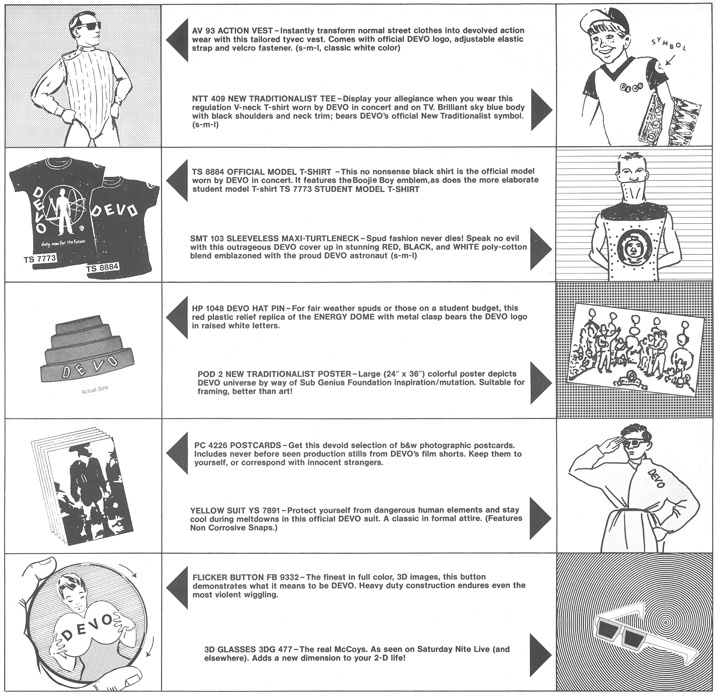 “Devo at our best is people going ‘Is that real or not?’” Mark Mothersbaugh said in 2010. Inventive and immersive as this all is, the group’s primary medium is one that’s typically taken at face value. To do so with Q: Are We Not Men? A: We Are Devo! would be to hear its satire, innuendo, and doublespeak as 11 tracks of leering, violence, and totalitarianism. Misinterpretation and misunderstanding was inevitable, but the band had a knack for leaving impressions it hadn’t intended. Appearing on Saturday Night Live shortly after the release of Are We Not Men?, Devo introduced a national audience to the album’s melted-down version of “(I Can’t Get No) Satisfaction,” but all that seemed to linger was the yellow jumpsuits. Years later, they’d pen an uncharacteristically optimistic anthem for a new decade with “Whip It,” but casual observers just heard sadomasochistic and masturbatory undertones. Devo anticipated MTV, but wound up confined to the channel’s one-hit wonder bin. As Casale likes to say, Devo were pioneers who got scalped. Though the group’s abstract-expressionistic patterns of sound are closely related to Eno’s own brand of experimentation (not to mention the recent work of David Bowie, who was once slated to produce this LP) and to a host of other art rockers, Devo lacks most of Eno’s warmth and much of Bowie’s flair for mechanized melodrama. For all its idiosyncrasies, the music here is utterly impersonal. This Ohio band either treats humanity as just another junky, mass-cult artifact to be summarily disposed of, or else ignores it completely. Q: Are We Not Men? A: We Are Devo! is a brittle, small masterpiece of Seventies pop irony, but its shriveling, icecold absurdism might not define the Seventies as much as jump the gun on the Eighties. As Carson notes, Bowie had told the crowd at Max’s that he’d be producing Are We Not Men? in Tokyo during the winter of ’78. But when Bowie’s commitment to David Hemmings’ Weimar period film Just A Gigolo interfered, his Berlin trilogy collaborator Brian Eno stepped in. This was a particularly productive period for Eno: Shortly after the former Roxy Music keyboardist holed up in Cologne with Devo, he’d head to the States for the one-two punch of Talking Heads’ More Songs About Buildings And Food and the seminal no-wave compilation No New York. Eno would go on to make two more Talking Heads albums, Fear Of Music and Remain In Light, and his work with David Byrne carried on into the 21st century. Things with Devo proved less fruitful. When it isn’t following the atmospheric example of Bowie’s “Heroes” or Eno’s own Music For Airports, the production on Are We Not Men? is compressed and claustrophobic—the sound of the walls closing in. It’s an echo of the band’s road-tested precision, the differential in frequency between the Bobs’ trebly attack and Casale’s low-end counterpoints accounting for what little space there is to be heard on “Uncontrollable Urge” or “Praying Hands.” Stiffness was the enemy of the breezy, boozy bands playing Akron dives alongside Devo, but it was a virtue to the group, the subject of a ripping single and the guiding principle of their onstage choreography. And it wasn’t camouflage for a lack of talent: These guys could really play, the addition of Myers opening them up to all sorts of odd time signatures and the influence of the wider punk scene (and the fact that they were no longer practicing and recording in an unheated Akron bunker) lending new speed and fury to songs like “Mongoloid” and “Gut Feeling/Slap Your Mammy.” “We practiced day and night, and on the weekends too—when other people were out getting loaded and getting laid—over and over until we got good,” Casale says in Rip It Up And Start Again. 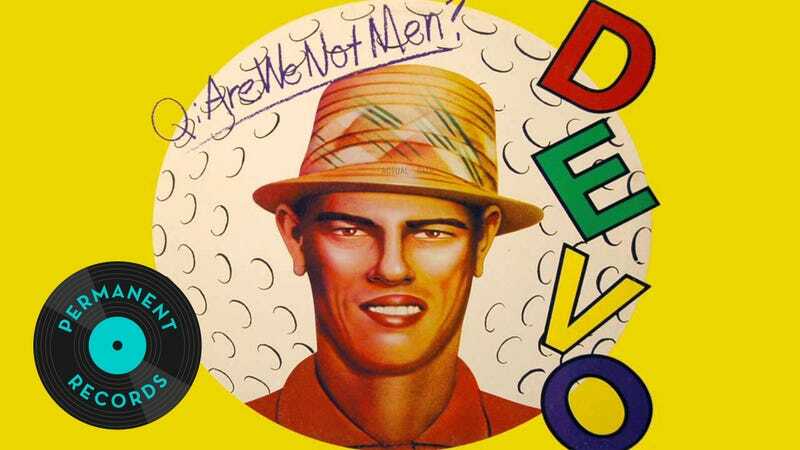 Devo would never sound as tight, pointed, and (contemporary reviews be damned) passionate as they did on Are We Not Men? All that time in Akron had given them the chance to hone a piercing worldview, of soulless drones sloppily pawing at each other to “outer space caveman music” while commerce invades every second of existence and technical advances turn against us. 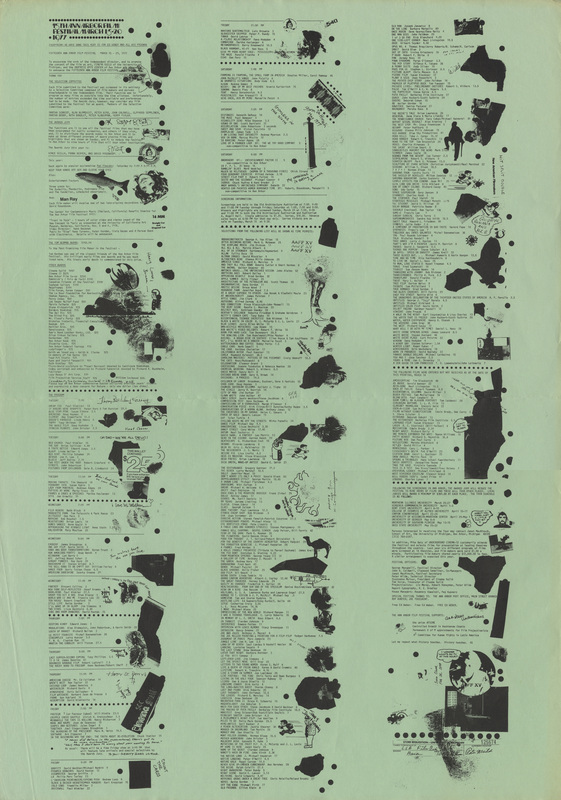 The group would quickly follow it up with 1979’s Duty Now For The Future, a nastier disc that courted further misinterpretation by titling its coldest blue-balls anthem “Triumph Of The Will.” (At the end of his review, Dave Marsh claims to have smashed his copy of Duty Now For The Future “lest it corrupt anyone dumb or innocent enough to take it seriously.”) But Devo didn’t care about vinyl by that point—it had its sights set on laser disc, and what was supposed to be the world’s first video LP, The Men Who Make The Music. Combining concert footage with short films previously screened at Devo shows, The Men Who Make The Music lampooned the band’s struggles within the record industry, making a plot point out of its decision to change up its stage wardrobe for album number two. Not coincidentally, The Men Who Make The Music and its anti-label goofs wound up getting shelved until 1981, following “Whip It”’s race up the charts. Of course the existence of that Noisey interview (or a similarly themed one in the online pages of one-time gatekeeper Rolling Stone—or a retrospective essay like this one) indicates that Devo’s legacy was already secure. So long as humanity keeps marching toward oblivion, launching junk into space, and acting on gut feelings and uncontrollable urges, somebody’s going to be around to say, “Devo was right!” In the past decade, a small wave of Midwestern punk acts has seemingly taken Are We Not Men? and earlier Devo recordings as their primary influence; you could slip Uranium Club’s “Who Made The Man?” between “Mongoloid” and “Jocko Homo” and nobody would be the wiser. There’s no beginning. There’s no end. We’re all Devo. We must repeat.